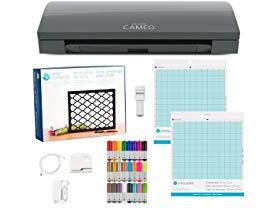 You will LOVE this *BEST PRICE* Silhouette Slate Grey CAMEO 3 Craft Bundle $189.99 (Retail $289.99). •Blade and other storage compartments keep all the extra blades and tools in one easy to access storage compartment. •The cameo machine no longer comes with a CD, but instead a card with a link to what used to be on the CD.